The Notes app is convenient for Apple users to store quick notes of daily life — a list of work schedules, travel plans or a quick sketch of your pet with drawing tools. Like other apps, things are going smoothly until your iPhone notes disappeared due to various reasons. 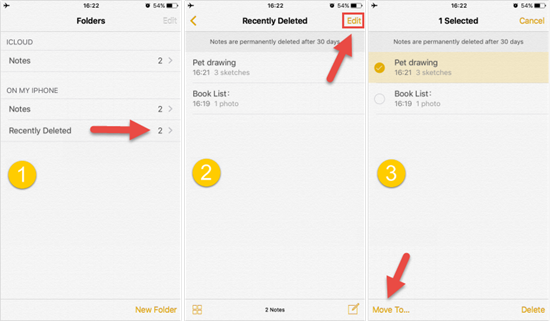 Thankfully, there are several free ways to retrieve deleted notes on iPhone or iPad. Just read on to find out how to recover deleted notes on iPhone or iPad quickly. Like the iOS Photos app, the Notes app running on iOS 9 or later also features a “Recently Deleted” folder that will store deleted notes for up to 30 days before they are removed permanently. Follow these steps to recover deleted notes on iPhone in minutes. Launch the Notes app on iPhone or iPad. Tap on the “Edit” button in the upper-right corner. Select the notes or tap “Move All” and move them to another folder. What if you can not find the “Recently Deleted” folder in the Notes app? Don’t worry! Gihosoft Free iPhone Data Recovery makes iPhone Notes recovery easy and possible. Even if you don’t have any backup, it helps to retrieve deleted notes on iPhone X, iPhone 8/8 Plus, iPhone 7/7 Plus, SE, 6S/6S Plus, 6/6 Plus, iPad Pro, iPad Air 2, iPad mini 4/2, etc. Just download it on computer and try for free. 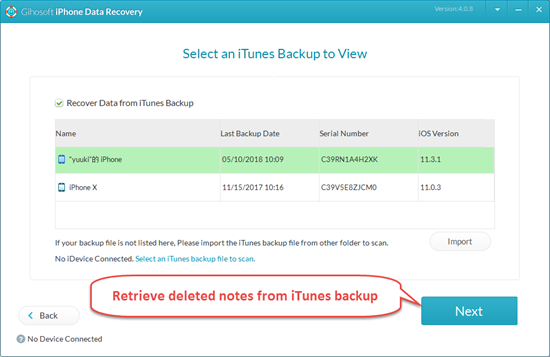 Step 1: Install & run the iPhone Note Recovery software and select the check box of Notes. Step 2: Connect your device to the computer (You can also skip to the next method to retrieve deleted notes from backup if your device was lost). 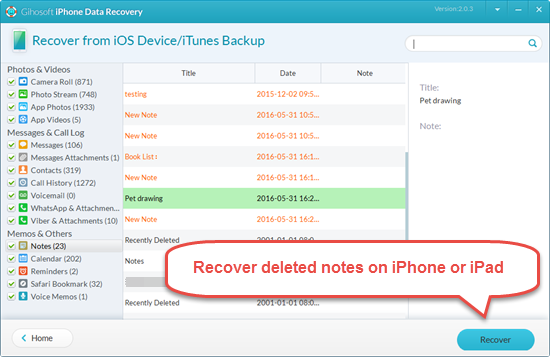 Step 3: After scanning, preview and recover the deleted notes directly from iPhone or iPad. 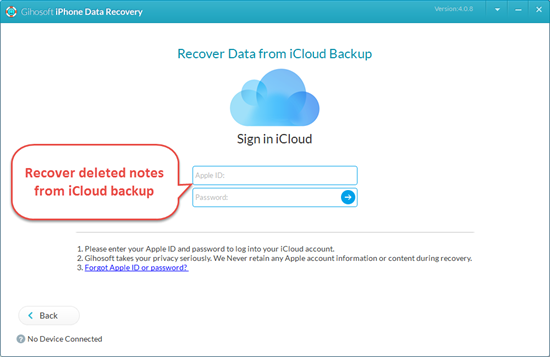 If your iPhone or iPad is not available, and you’ve backed up the deleted notes recently, you can retrieve notes from backup directly. For iOS device, iTunes and iCloud are the two most efficient ways of backup, and you can restore deleted notes easily if you sync with them every once a while. But if you restore whole device from iTunes or iCloud directly, it will wipe your current data first. Hence, here offers you another way to retrieve deleted notes on iPad or iPhone. Run the iPhone Notes Recovery and select “Notes”. Click “View iTunes Backup” and select the latest backup. After scanning, preview and retrieve deleted notes on iPhone or iPad. Open iPhone Data Recovery and check the box named “Notes”. Choose “View iCloud Backup” and sign in with Apple ID to download backup files. After scanning, you can selectively recover deleted notes on iPad or iPhone. Some cloud services allow you to sync your notes onto their servers, such as iCloud, Gmail and Yahoo mail. So you can first check your accounts on these services and then get back the missing notes. Check iCloud Notes and sync to iOS devices: Sign in to iCloud.com > Click Notes icon; If the lost notes are there, go back to iPhone/iPad > Setting > Apple ID> iCloud and switch on Notes; Then, connect to Wi-Fi or cellular data, open Notes app and they will sync back to your device soon. Get back Notes from other Email accounts: Settings > Mail, Contact, Calendars > Gmail (or other Emails) and toggle Notes to On. After that, the lost notes should come back to your device. Tip: Besides notes, this iPhone Recovery software also help you recover deleted iPhone messages, contacts, call logs, WhatsApp messages, Viber chats, photos, videos, calendar, reminders, Safari bookmarks, voice memos, voicemails, and more.